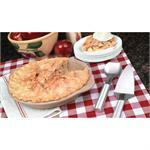 This 9" stoneware pie plate absorbs heat to maintain an even baking temperature for perfect results. 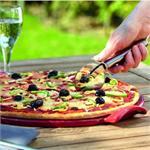 You can also use it for baking light fluffy buns and sweet rolls or crisps and cobblers. 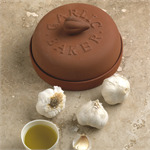 Use this Terra Cotta baker to roast fresh garlic in your regular, convection, or microwave oven. Serve garlic whole or squeezed from its skin; delicious as a spread or to flavour vegetables, pasta, chicken, sauces, salads, etc.